Getting low and wide for a different perspective is always fun. I joined my friend Lory at her nursery this morning to pick up a plant I've been trying to find since last year and she had one for me. While I was there we took a walk through the grounds and out to her own hidden garden so I could see her trillium kurabayashii, a large plant that is extremely slow growing that she's been carefully propagating for years. They're native to southwest Oregon and are considered rare probably because they take years to mature to the point where they flower and are relatively fragile. However when given the right care they will self-seed and in a few years a nice colony will establish. 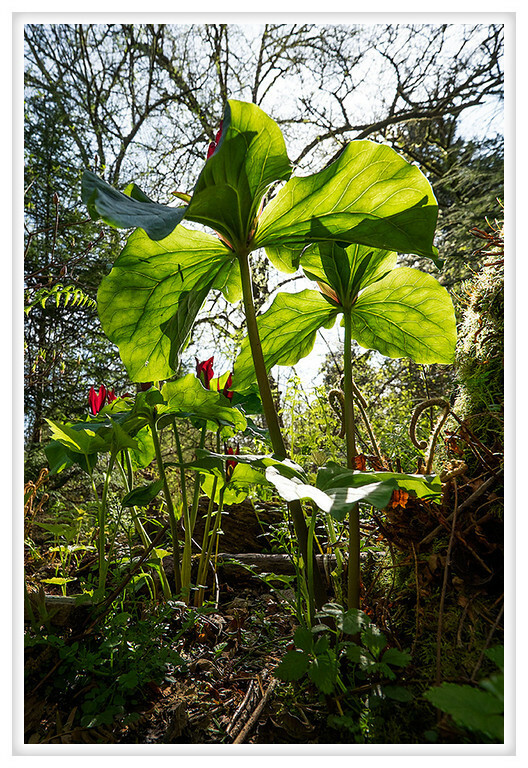 They are beautiful plants with large mottled leaves and deep red flowers with upright petals and a more open form that most of the trilliums we are accustomed to seeing.